Kinder to the skin, using over 22,000 sonic waves instead of harsh rotation to deliver a deep, gentle clean, clearing skin of dirt and makeup build-up multiple times a day! 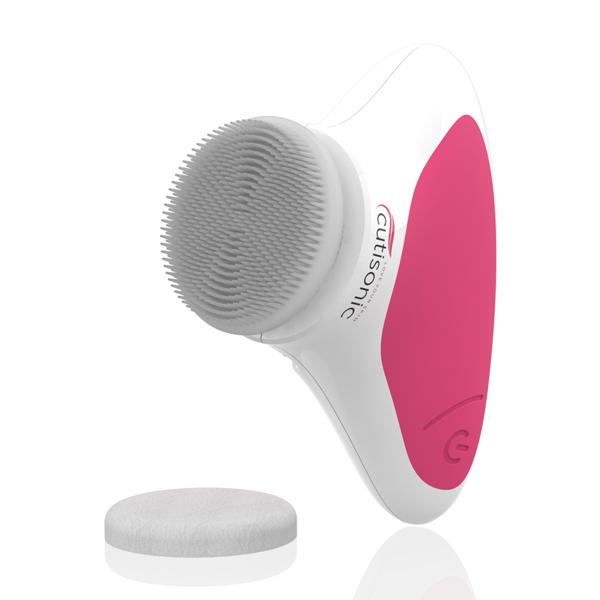 The Cutisonic facial cleansing brush is specially designed to restore clearer, glowing skin with the appearance of pores minimised and the signs of ageing targeted. It boosts the effectiveness of your face washes, makeup removers and even soaps whilst the deep cleanse helps to fight acne, spots and pimples, for clearer, happier complexions. The cleanse pad is also designed to last, withstanding daily use for months before needing to be replaced. Made from hypoallergenic elastic silicone and suitable for all skin types, even sensitive skin. Washable, with no particle loss. To clean, simply remove from Cleanse & Apply device and wash with natural detergent in warm water. That’s not all though, as this innovative facial cleansing brush doubles up as a makeup applicator, using micro-vibrations to effortlessly smooth cosmetics and creams over complexions for even coverage, deeper colour and a flawless finish. It takes just seconds to switch between modes, making it the perfect companion for morning and evening. The Cutisonic makeup sponge can be paired with cream and liquid foundations, liquid blush, concealer and even powders, including bronzers, highlighters, pressed and loose powders! Made from high grade anti-static absorbent PU foam with advanced polymer technology to avoid particle loss. Simply attach the new pad to the Cutisonic Cleanse & Apply for smooth, even coverage. Once you’re done, this 2 in 1 applicator can easily be washed and even used in the shower with a robust, IPX6 water-resistant design! Battery powered, requires a single AA battery (included, lasts over six months after activation via tab removal). ASDA toyou Service: Where you see the ASDA logo, we offer a Click & Collect service from over 600 ASDA stores. Please Note: This service is only available when ALL the items in your basket are eligible for ASDA toyou. Click here for more information. Click & Collect from your chosen Asda store with their amazing 'toyou' service.